Ryan Lochte is...a character. Let's just leave it at that. But still, he's a buff Olympian with a bod (and face) that begs — nay, demands — to be looked at. So, you'd think his intro to tank tops would be the beginning of a beautiful friendship. 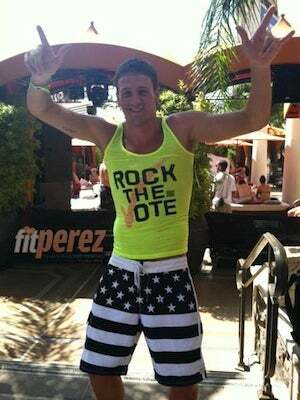 Sadly, that was not the case when buddy over here decided to wear a "Rock The Vote" muscle tank and (wait for it) American flag swim trunks at a Scan To Vote event. He's certainly made a statement with his fashion (case in point) — and whether you think that's a good thing or not is entirely up to you — but still, this stands out. In a MTV Spring Break circa 1996 sort of way (perhaps you only remember the Gavin Rossdale-in-the-rain moment, but we assure you, there was so much more happening). But we digress. When it comes down to it, we're really pleased to see Ryan encouraging young people to vote. That's one of the most important, and simplest, gestures a celebrity can make right now. But on the fashion front, we're less pleased. Let's all take a moment to contemplate the burning question: What defines Ryan Lochte? The answer is, of course, Ryan Lochte. But you tell us: Are we being too harsh? Do you find the too-small neon tank more appealing than we do?